When run, the application described in this part of the tutorial shows a window containing text labels that can be shown side-by-side or individually depending on the available screen space. The main program is longer than in the previous part of this tutorial, so we will not show it all here. We will focus on the parts that are specific to this example. This is done in the same way as in the previous part of this tutorial. The Leaflet widget is a container that manages the dimensions of its children. We divide these into two pages that can be displayed side-by-side if there is enough space, or are otherwise shown individually and can be flipped between when the leaflet is folded. The buttons in these pages will be connected later in the method. We also add the leaflet to the window to ensure that it is shown. Since the pages can be shown side-by-side, we want to hide the buttons in that situation so that they are not confusing for users. We also connect the clicked signal for each button to a method that will show the page associated with that button. The widget is supplied as the last argument to each connection. Note that we define a default size for the window. 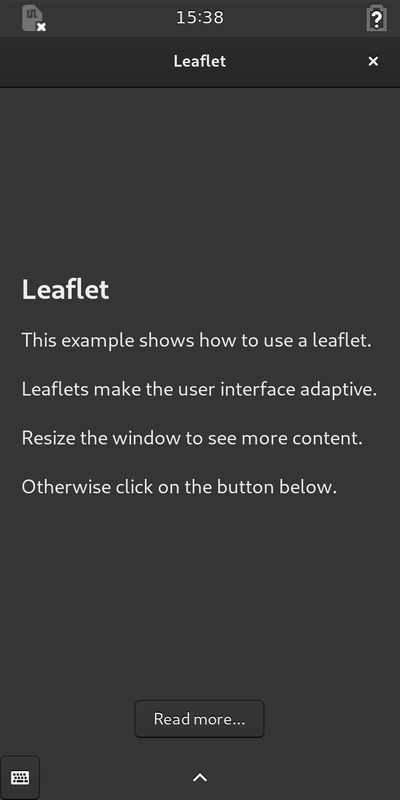 This helps to inform the leaflet about its initial state when the window is shown – whether it should be folded or expanded. Without this information the buttons may appear when the leaflet is expanded. Here, the page supplied as an argument is passed to the leaflet so that it can be shown. The leaflet performs the transition defined earlier in order to display it. Since a slide transition was specified, the current page slides smoothly away and the new page slides into its place. This part of the tutorial showed the use of the Handy.Leaflet widget to provide an adaptive container for the contents of a window, showing as much as possible if there is enough space, and otherwise presenting its contents as a foldable stack of pages. Each page is defined as a Gtk.Box then added to the leaflet using the leaflet’s add method. Connections from buttons in the pages to a method allow the current page to be changed on a button click, using the leaflet’s set_visible_child method. By binding the folded property of the leaflet to the visible properties of the two buttons, we ensure that they are only visible when the leaflet is folded. In the next part of this tutorial we will use two leaflets to synchronize the window’s title bar and its visible contents.